Every post on Foot.ie has a Report This Post button which you can click to report abuse direct to a forum moderator. If your report isn't acted upon, please contact the relevant moderator directly. Failing that, please post in the Support forum. 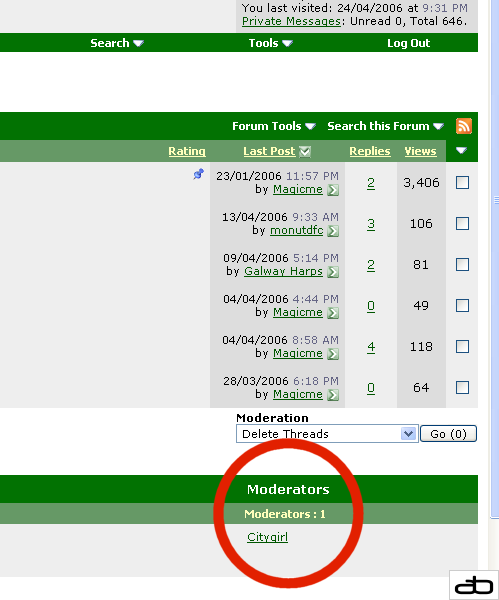 The moderators for each forum are listed at the bottom-right of each forum index. To contact the moderator, click on their username and then click Send a message via email or Send a private message on their profile. Click the multi-quote button on each post you want to quote, which will turn red when activated, then click Post Reply. Alternatively, click the multi-quote button on all but the last post you want to quote, and the Quote button on the last one. The result will be the same. If you have a valid reason, you can change your username once. Your old username will appear beneath your new username for 30 days, at which point you can request it's removal in the Support forum. You'll need to login with the new username, but all posts, threads, private messages, infractions, etc, will stay the same. To start the process, post a request in the Support forum with the username you want to change to, and the reason why it's needed. You won't be allowed to change username again, so get it right! The change may take a few days. If you'd like to browse Foot.ie on your mobile phone, visit m.foot.ie to be automatically load our Mobile style, or choose it from the dropdown at the end of the page. (Click here to activate if now.) To get back to the standard Foot.ie style, click Default Style at the foot of the mobile style. We don't keep individual records for rejections, but signups are usually rejected for one of the following reasons: the username was offensive; a player, club, business, celebrity or other well-known name was used; the username was in CAPS; the account was a duplicate; it was intended to be used as a role account; the signup came from a banned user. If your account was suspended because of email issues, you can reactivate it automatically by changing the email address in your profile, which will generate an email to the new address asking for confirmation. If the existing email address had an issue but works correctly now, you can have the activation email sent by clicking here and filling in the address. NOTE: If you use Hotmail or any other webmail client that frames external links, you'll need to copy and paste the link in the activation email into the address bar. Most likely because your email address is no longer working, and messages generated by the forum software are bouncing back. If this happens you'll need to login and update your profile with an active email address. An email will be sent to your new address, and when you have confirmed the new address you should be able to post again. If you can't, THEN contact the adminstrator to check over your account. And not before. If you're interested in a particular forum and it doesn't already have a mod, I'll consider it -- PM or email dahamsta with the details. For YouTube, copy the movie code from the address of the movie page in your browser's Location or Address bar. For example, in the following address, the movie code is ry_dNijE4o8, as highlighted.